Katie Murray joins the team of instructors. We are delighted that Katie Murray has joined us as a GYROTONIC® exercise Instructor. After graduating Katie was invited to join Northern Ballet’s Graduate Professional Programme where she danced numerous roles with the company. 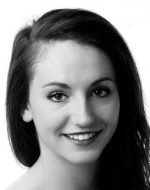 Katie also performed classical and neo-classical works in Germany and the UK with JSLN Dance Company. During her time as a dancer Katie came to value the importance of strength and conditioning training which led her to take an interest in the GYROTONIC® system. Deciding that her passion lay outside of a performing career Katie decided to retrain as a GYROTONIC® instructor and is looking forward to joining the team at Penny Withers Studio.